Washington, DC is a city full of monuments. Some are fashioned from marble and stone. Some exist only in the minds and memories of everyday people. All of them preserve histories of crisis and triumph. This is the story of one of the District’s hidden monuments. In 1975, the band Parliament released the album Chocolate City, forever immortalizing the mid-twentieth century demographic and cultural identity of the nation’s capital. In 1968, the assassination of Martin Luther King, Jr. sparked an urban rebellion and the mass exodus of white DC residents (a process that actually began over a decade earlier after the 1954 Brown v. Board of Education Supreme Court decision triggered white flight to the suburbs). By 1970, the city was 71 percent Black. In 2011, DC’s Black population fell below 50 percent for the first time in more than five decades. According to census data cited in The Washington Post, between 2004 and 2014, the number of African-Americans living in the District dropped by nearly forty thousand. The process of gentrification and displacement has impacted not only the people but the culture of Washington, DC – a city that produced Duke Ellington, Roberta Flack, Marvin Gaye, Chuck Brown and iconic venues like Bohemian Caverns, which recently closed its doors on the historic U Street corridor. The Mousai House is a community of young artists that blossomed during this tumultuous period in the city’s history. In many ways the history of Mousai mirrors the history of Black Washington. It is the story of a community who took run-down, forgotten spaces and made them vibrant with music, art, and culture. It’s the story of loss. As the artists of Mousai face displacement for the second time, they are laying the foundation for what could potentially be a game-changing shift in DC’s creative economy. They envision a new arts scene; one that the artists themselves control, where they pool their resources to purchase the buildings where they create, the equipment they need, and the spaces where they live. On a small scale, Mousai is laying the foundation for what Dr. Jessica Gordon Nembhard calls a Cooperative Solidarity Commonwealth. 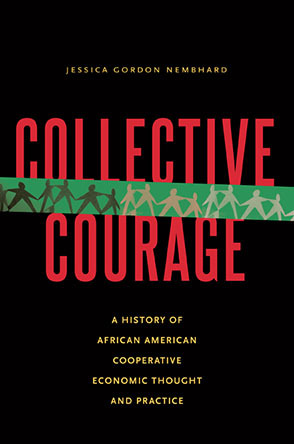 She envisions this to be “a system of interlocking cooperative ownership structures in all industries and all sectors of the economy, where cooperatives and other community-based enterprises support one another by building linked supply chains, collaborating on projects, and sharing funding.” As a professor, economist, and author of the most comprehensive history of African-American cooperatives to date, Dr. Nembhard has spent years studying cooperatives as an economic survival strategy. The seeds of the next system have long been planted in low-income Black communities where cooperative principles and strategies are an integral part of everyday life. The Mousai House is one example of how cooperatives often begin informally to satisfy an economic or social need. Early on, a cadre of DC’s leading young musicians came on board to help teach. Obie Gereau taught keys and theory; Dante Pope taught voice, theory, and drums; and Ajene Harley taught guitar. One of the first guitar students was a local MC named Dior Ashley Brown. The Tuesday music lessons turned into all night jam sessions, attracting the cream of the crop of local hip hop, soul, and jazz musicians. Maimouna Youssef, Tamika Love Jones, and the CooLots were there. It was an informal network of peer-to-peer knowledge sharing that operated outside of the confines of the traditional economy. “While we were in those early stages it was a value exchange rather than a monetary exchange,” Jones shared. “And people found value in having a creative space in which to collaborate with other artists.” This reinforces Dr. Nembhard’s belief that the next economy must move beyond the price system. “Of particular importance,” she explains, “is the fact that resources are not solely financial. It’s not just about market relationships.” From the beginning, this has been a core value in the Mousai House culture. The Mousai House had become a music school, a performance venue, a studio and a community center all-in-one. Social media was peppered with flyers for events and classes. What started as a hobby had evolved into something much more. But there was one small problem: the little home on Evarts Street was a rental, and the owner was returning back to the United States from the Peace Corps. Their lease wasn’t going to be renewed. Ownership is a recurring theme in both the Mousai House story and the history of Black Washington. For generations, restrictive covenants, redlining, and race-based housing policies limited ownership opportunities for African-Americans in the district. Similar policies and practices in commercial real estate created the same dynamic. Collective ownership is a cornerstone of the next system Dr. Nembhard imagines. Not only should real estate be affordable and cooperatively owned; but ideally, it would also be completely decommodified. The strong personal relationships and professional network that emerged from the Tuesday night sessions produced some leads for a new space. “Right when the lease was coming to an end one of my guitar students, Aaron Jackson, hit me up on the phone and said, ‘Hey, you remember the old Warehouse Loft?,’” Jones recalled. They discussed a potential opening at Union Arts, a DIY arts space which had taken over the building formerly occupied by the infamous Warehouse Loft parties. There was indeed an opening, and two weeks later the Mousai House relocated to 411 New York Avenue NE. After Mousai took off in its first few years, Jones left his job to help create a structure for the organization so that it could continue. In order to help cover costs for the new space, Mousai developed a membership structure. Monthly memberships range in price from thirty to fifty dollars. The basic membership includes access to a shared work space, entrance to the Tuesday night classes and the jam sessions that follow, and discounted tickets to the concerts that happen on the last Saturday of each month (past performers include the legendary hip hop icon Bahamadia and the prolific LA-based musician Georgia Anne Muldrow). Resident artist members also get discounted studio time, and access to other resources and support. The membership structure helps Mousai artists pool their resources to maintain affordability and cover the shared costs of the space. And it’s just the beginning of a larger vision of a cooperatively-owned artist incubator. From the time the Mousai House arrived at Union Arts, there were murmurs that the building could be sold at any moment. The warehouse had been on the market since 2012. In January 2016, Mousai and the other artists at Union Arts received notice that the building had been sold to developers and was slated to become a boutique hotel. They had less than nine months to prepare for their impending eviction. For Mousai, lightning had struck twice. They were once again facing displacement, this time from one of the city’s last remaining independent arts spaces. Instead of simply packing their bags, Mousai joined forces with Union Arts, the Nomad Yard Collectiv and over 100 artists to form the Artists Union. Using the social media hashtags #SaveDCArts, #iWillNotBeMoved, and #aGentrifiedDC, the artists banded together in a David and Goliath fight against the developers. CulturalDC, a DC-based non-profit, is partnering with the developer to manage the arts spaces in the building. Two floors of the eleven-story hotel will house eight artist studios, a gallery and an art classroom. According to existing tenants, this will provide space for only a fraction of the number of artists that currently utilize the space. These plans highlight the urgency of Mousai’s vision for a new creative economy. Art and arts spaces must be cooperatively owned by artists. Dior Ashley Brown explained, “I come from generational ownership. My granddaddy had a bike shop at 14th and V. We do want ownership. Now we’re getting more strategic.” She adds that their primary goal is to maintain affordability and accessibility. “It just goes back to the basics of what we had at the house: The bartering system,” Gaje Jones explains. “You know what, we’ll forgo your membership for this month if you can do some bass classes for us, or if you can do this for us. I got a member who really wants to learn Pro Tools, can you give him some one-on-one instruction twice a week? And the value isn’t placed in monetary terms, it’s placed in relationships; because now those two people are working together on a new project. Real talk – this is actual, not hypothetical, this is what’s happening. Two DJs are linking up, one just wanted to learn Ableton but now they’re producing stuff together. We’re developing relationships. We’re developing bands like Redline Graffiti that started at Mousai. Jennifer Bryant is a DC-based writer, organizer and radio host. She is a founding steering committee member of Cooperation DC (a project of ONE DC). Cooperation DC's mission is to expand opportunities for dignified employment and democratic ownership in low-income communities of color through the development of worker-owned cooperatives. Jennifer co-hosts Voices with Vision - a weekly radio show on WPFW 89.3FM - and produces Agenda 2016, the station's national elections coverage.